PRESIDENT Mugabe yesterday reconnected with former Vice President Emmerson Mnangagwa as he begins processes towards a final solution and roadmap for the country. 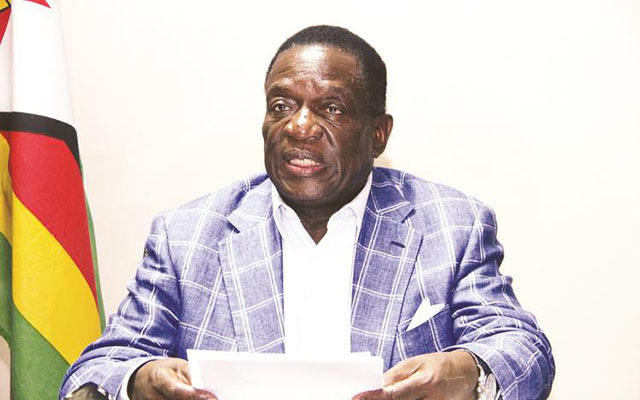 Cde Mnangagwa was fired from the Vice Presidency by President Mugabe on November 6, precipitating a chain of events that culminated in the Zimbabwe Defence Forces intervening to weed out criminals who had surrounded the President and who stoodaccused of fomenting an environment that had the potential to lead to violent confrontation. Sources close to developments said the two spoke for about 10 minutes over the phone after midday,and during the conversation President Mugabe told Cde Mnangagwa to return home immediately. Cde Mnangagwa acceded to the request. The former VP is said to have told the President that he had left Zimbabwe for security reasons to which the President assured him he had nothing to fear as he was not involved in any threats that may have been posed. Updating the nation on the latest developments last night, Zimbabwe Defence Forces Commander General Constantino Guveya Nyikadzino Chiwenga said the ZDF were pleased with new the latest developments which included contact between President Mugabe and his former deputy. Cde Mnangagwa, he said, was expected back in Zimbabwe soon. “As this happens, we as the Zimbabwe Defence Forces and security services urge Zimbabweans to remain calm and patient, fully observing and respecting the laws of the country for the sustenance of the precious peace we should never lose,” he said while briefing journalists at Josiah Magama Tongogara Barracks, formerly KGVI. Gen Chiwenga also urged other political players in the country including members of the ruling Zanu-PF, war veterans, opposition parties, students and members of the public to refrain from any conduct that threatens peace, life and property. He urged students at various institutions across the country to be calm and proceed with their educational programmes as scheduled. He said the ZDF would keep the nation updated on any new developments as they occur. Gen Chiwenga commended the meeting the ZDF held with President Mugabe, which he said went well in a conducive atmosphere of mutual respect saying several guarantees were made. He said the ZDF remained seized with the operation they codenamed ‘’Operation Restore Legacy”. The media briefing was meant to update the nation on the latest developments after President Mugabe’s address to the nation on Sunday night. In a televised State of the Nation Address at State House, President Mugabe conceded that there was a crisis in the country and concerns raised by the ZDF and citizens relating to the state of the economy were genuine. He said Zimbabwe would chart a new path aimed at restoring normalcy in the country. The address came after President Mugabe held a meeting with military commanders that focused on several issues both at Government and party levels. He also conceded that Zanu-PF was also facing challenges that required attention. These would be dealt with at the forthcoming Extraordinary Congress scheduled for the week December 12-17 2017.